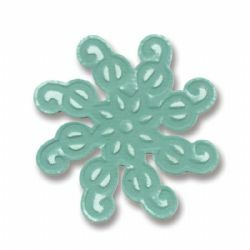 Measuring approximately 2 3/8" x 2 1/2", this Embosslits die showcases the deliciously different style of BasicGrey. This die is designed for use with the BIGkick, Big Shot and Vagabond machines (with a pair of Cutting Pads and the machine's included Platform), as well as the original Sizzix Machine (with System Converter and a Cutting Pad) and the Sidekick Machine (with a pair of Cutting Pads). All items sold separately.